17 May 2010, at 11:47a.m. 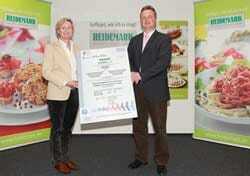 GERMANY - The first GLOBAL GAP certificate for turkey production has been awarded to Heidemark. On 3 May 2010, the first GLOBALG.A.P certificates for turkey production were awarded to two regional poultry producers in Germany. The event was attended by GLOBALG.A.P representatives. The certification has been carried out by SGS, the world's leading company on the inspection, testing and certification market. Heidemark is one of the leading manufacturers of turkey products in Germany. Dr Ronald Günther, veterinary surgeon at Heidemark says: "Heidemark was one of the first companies in Europe to be involved in determining suitable auditing procedures for turkey production. This was done in cooperation with SGS and GLOBALG.A.P. The pilot audits were successfully performed at Heidemark by SGS." The new module for certifying turkey production is part of GLOBALG.A.P's international Integrated Farm Assurance Standard (IFA) and is intended to serve as a bridge to national standards. Dr Roland Aumüller, veterinary surgeon, responsible for livestock standard development at GLOBALG.A.P, says that the audited turkey producer must comply with GLOBALGAP's All Farm, Livestock Base and the new turkey modules in order to achieve GLOBALG.A.P certification. He explained: "The GLOBALG.A.P turkey inspection covers more than 100 criteria that were examined by SGS. The turkey module follows the same structure as the other modules and contains 31 critical 'Major Musts', 62 'Minor Musts' and 10 Recommendations. The topics of the 13 sections to be inspected annually and to be met by turkey producers are as follows: provisions for poults, supply of feed and water, housed and free-range turkeys, shed facilities and their mechanical equipment, turkey health and veterinary care, hygiene and pest control, handling, and residue monitoring, emergency procedures, workers' knowledge and qualifications, and loading and transport of birds for slaughter in accordance with best professional practice. "Full records of health data by the livestock owners in conjunction with compliance with the regulations set out in a written Veterinary Health Plan (VHP) are critical Must criteria. A demanding VHP is therefore one of the cornerstones for compliance with the GLOBALGAP turkey module. Matters relating to animal welfare are integrated in many of the control points. Particular focus is directed to poultry handlers' knowledge of animal welfare and its implementation in daily practice." Commenting on the certification by SGS, Jürg von Niederhäusern from the Swiss chain, Migros, said: "We are pleased that the producers appointed by Heidemark have received the first GLOBALG.A.P turkey certificates. This takes us a decisive step forward in our efforts to implement GLOBALG.A.P in the poultry sector." Describing the function of SGS, Betina Jahn, Product Manager in the field of Agricultural Services said: "We have an obligation to audit the standards of the system provider GLOBALG.A.P at our customers' firms. As an international company we are able to deal with both national and international questions in a combined audit. This is an important contribution towards limiting unpopular audit tourism as far as possible."